Chicago Review Press, 9781613747100, 256pp. Martha Gellhorn jumped at the chance to fly from Hong Kong to Lashio to report firsthand for Collier’s Weekly on the conflict between China and Japan. When she boarded the “small tatty plane” she was handed “a rough brown blanket and a brown paper bag for throwing up.” The flight took 16 hours, stopping to refuel twice, and was forced to dip and bob through Japanese occupied airspace. 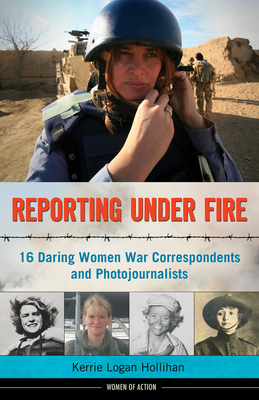 Reporting Under Fire tells readers about women who, like Gellhorn, risked their lives to bring back scoops from the front lines. Margaret Bourke-White rode with Patton’s Third Army and brought back the first horrific photos of the Buchenwald concentration camp. Marguerite Higgins typed stories while riding in the front seat of an American jeep that was fleeing the North Korean Army. And during the Guatemalan civil war, Georgie Anne Geyer had to evade an assassin sent by the rightwing Mano Blanco, seeking revenge for her reports of their activities. These 16 remarkable profiles illuminate not only the inherent danger in these reporters’ jobs, but also their struggle to have these jobs at all. Without exception, these war correspondents share a singular ambition: to answer an inner call driving them to witness war firsthand, and to share what they learn via words or images. Kerrie Logan Hollihan is the author of Elizabeth I, The People's Queen; Isaac Newton and Physics for Kids; Rightfully Ours; and Theodore Roosevelt for Kids. She has written for Bird Watcher's Digest and Boy's Life. She lives in Blue Ash, Ohio.